If you're one of the millions of Americans who's chronically sleep deprived, a new study may give you a little more motivation to get your zzzzz's. Researchers found that people who slept less than six hours a night were over four times more likely to catch a cold than those who got more than seven hours of sleep. The findings were published today in the September issue of the journal Sleep. A team of researchers from the University of California, San Francisco, Carnegie Mellon University and the University of Pittsburgh Medical Center worked together for what they say is the first study to use objective sleep measures to connect people's natural sleep habits and their risk of getting sick. "Americans are not getting enough sleep. They know that and we know that," lead study author Aric Prather of UCSF's department of psychiatry told CBS News. "While there is a growing scientific literature supporting a link between sleep and the immune system, much of this work is based on either a person's self report of their sleep, which can be biased, or laboratory studies where sleep is restricted, which is a sort of extreme sleep loss not typical for the average person." 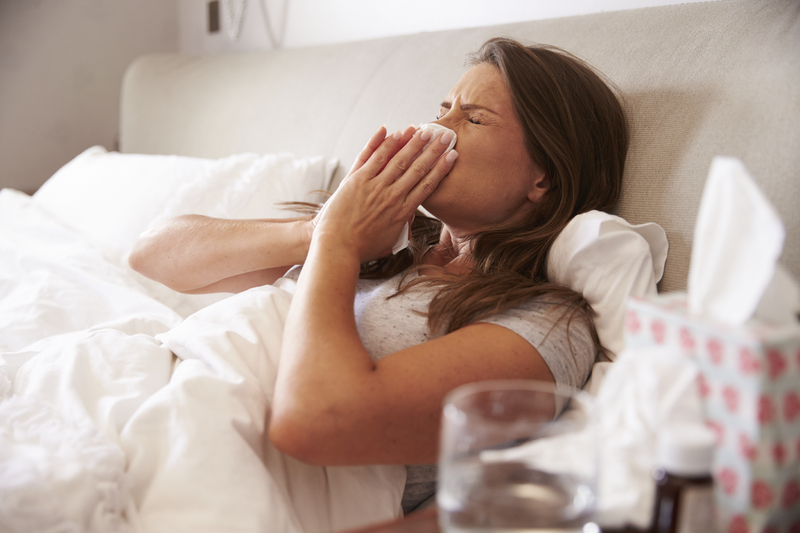 To address these gaps, the researchers objectively tracked the sleeping habits of healthy adults and then infected them with a live cold virus. For the experiment, 164 volunteers, men and women aged 18 to 55, were given the rhinovirus, the most common cause of the common cold. The week prior, researchers measured participants' normal sleep by using a watch-like sensor that measured the quality of sleep throughout the night. The researchers sequestered the volunteers in a hotel for the next seven days, administered the cold virus through nasal drops and monitored mucus samples to see if the virus had taken hold. The results showed that those who had slept less than six hours a night the week before were 4.2 times more likely to catch the cold when compared to those who slept for more than seven hours a night. Those who slept less than five hours were 4.5 times more likely to get sick. The study authors took other factors into account including age, race and smoking status, among others. The Centers for Disease Control and Prevention has called insufficient sleep a "public health epidemic" and a 2013 survey by the National Sleep Foundation estimates that one in five Americans gets less than six hours of sleep on the average work night. "If you don't get sleep, it affects you physically and mentally," Dr. Carol Ash, director of sleep medicine at Meridian Health in New Jersey, told "CBS This Morning." Lack of sleep "will decrease the activity of cells that are important for your defense to resist the cold. It also increases inflammation which can injure tissues and decrease defense." Ash, who was not involved in the study, said there's increasing evidence that "Once you get less [sleep] than you physiologically need, you start to fall apart." The researchers said this new study is just one more piece of evidence that sleep, just like diet and exercise, is a crucial part of public health -- and attitudes toward it need to change. "Sleep often takes a back seat to other health behaviors in terms of attention and investment," Prather said. "This shouldn't be the case." He pointed to the example that most people don't brag about how much time they spend sitting on the couch or eating fatty foods. "In contrast, I commonly hear people bragging about how much they can accomplish on limited sleep," he said. "Changing the culture around sleep and sleep health is critical to changing individual behavior. Hopefully this study can help provide the scientific evidence." Previous studies have shown that inadequate sleep may increase the risk of car crashes, medical errors, chronic illnesses and even premature death. Prather said future research will focus on getting a better understanding on the relationship between sleep and the immune system, particularly if there are specific aspects of the immune system that are uniquely tied to sleep.